نعل من الجلد السويدي للمساعدة في منع الانزلاق. روبيز ستحصل عليها بأناقة مع النعل الناعم المكاسين المصنوع من الجلد من Premuim حاز على ختم قبول من الرابطة الأمريكية الطبية للعناية بالبشرة (APMA). جزء علوي من الجلد المعدني المرن. شرائط وشرائط مزخرفة. طوق مرن لملاءمة آمنة. تصميم سهل الارتداء. بطانة من الجلد السويدي الناعم والنعل الخارجي. روبيز ستحصل عليها بأناقة مع النعل الناعم المكاسين المصنوع من الجلد من Premuim حاز على ختم قبول من الرابطة الأمريكية الطبية للعناية بالبشرة (APMA). جزء علوي من الجلد المعدني المرن. شرائط وشرائط مزخرفة. طوق مرن لملاءمة آمنة. تصميم سهل الارتداء. بطانة من الجلد السويدي الناعم والنعل الخارجي. مستوردة. After reading the reviews on how these shoes run large I decided to order a size smaller than I had originally picked out. My daughter is 7 1/2 months old but is extremely big for her age. She is in 12-18 month clothing. I even found the Robeez shoe sizing chart. On that chart her foot was a size 4.5, which corresponds to the 12-18 month size. I went with my gut and order a size down. I got the 6-12 month and they are perfect. They fit and she has almost a half an inch to grow. Love, love love! These gold moccasins go with EVERYTHING. Yes, Robeez run big. My 9 month old just now outgrew her 0-6 month size Robeez and she wears a size 3 shoe. She just started wearing the 6-12 month size, and they are big, but manageable. With my kids, I've had 3, they've always been about three months behind Robeez sizing. Example, wore the 0-6 month size from 3-9 months, and wore the 6-12 month size from 9-15 months, etc. But it all depends on your little one's foot size.....they are all different! These are outstanding baby shoes! They stay on all day! I just ordered 2 more styles. Yes, fit is large for sure so just order down a size down. I ordered 6-12 months for my 15 month old and they fit perfectly, with ample toe room. 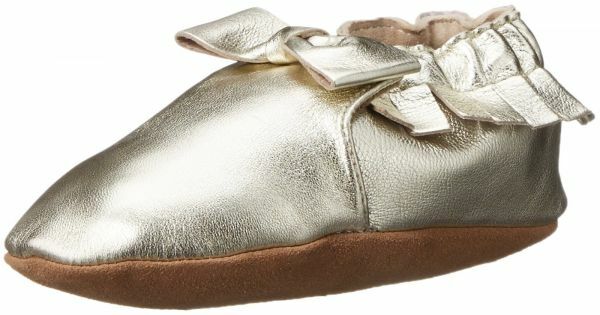 The gold moccasins are adorable and we get compliments on them anywhere we go. My little girl loves wearing these shoes. They keep her feet warm and help her walk since the sole is a soft sole she can feel her toes on the floor beneath her which really helps with balance for new walkers. These are great for going out and walking on smooth surfaces. I wouldn’t let them get wet though as they are leather. I knew this brand ran large so I ordered 0-6 month for my 12 month old and they fit her perfect. She’s normally a size 3 in other brand shoes. I plan to order another pair of Mocs in the next size up and soon. Love, love, love these adorable "shoes"
I love Robeez shoes for my babies. They are so, so cute and keep their little feet warm and covered. I bought these moccasins for my 5 monthly old daughter and they go with everything. She's starting to spend time in the bouncer/activity station and likes to "stand" on various tables, etc. so the suede soles give her a bit of traction and also keep her feet clean...which is important as they promptly go into her mouth! Robeez are a roomy fit (like a slipper), but the elastic ankle keeps them on your baby's foot. It's also great because they'll fit for a longer period of time. I also thought the price was great for a pair of leather moccasins - the other ones I was considering run closer to $60. I own a few pairs of Robeez shoes and am planning to grab some more. Love them!